The birth of your child is miraculous–a moment in which it seems that time stands still as a treasured human is ushered into the world. However, the circumstances that precede this moment can quickly turn tragic, if the medical professionals who are responsible for ensuring your safe delivery fail to adapt to the situations that they may encounter along the way. Due to the unpredictable nature of labor and delivery, it is essential for health professionals to continuously assess and proactively address potential complications. Failure to do so can result in devastating consequences, particularly for your child’s brain if he or she is deprived of oxygen or otherwise put at risk during the delivery process. Often, medical negligence can lead to permanent brain damage and disability which requires long-term treatment and accommodations, altering your life and your child’s life forever. In order to hold negligent healthcare providers responsible, and to ensure that your child is adequately prepared for his or her future needs, you can use the law to ensure that your voice is heard. At Fronzuto Law Group, our skilled pediatric and medical malpractice attorneys will work tirelessly to obtain maximum compensation for your child’s current and future medical care, including medications, adaptive equipment, physical therapy and life care planning, as well as the pain and suffering that resulted from their injuries. With over 75 years of combined experience, our attorneys have represented clients in a myriad of complex, brain and spinal cord injury cases involving cerebral palsy, cord compression from infection or abscess, bacterial meningitis, viral encephalitis, and other conditions known to cause damage to the brain and spinal cord. Schedule your free initial consultation with one of our highly knowledgeable lawyers today by calling 973-435-4551 (toll free at 888-409-0816) or contact our law firm online. Answers and advocacy are just a phone call away. You depend on your obstetrician to safely deliver your child through childbirth. When the doctor, nurse, or other member of the medical staff is careless or negligent, it could lead to catastrophic injuries to your child. In some of the worst cases, a medical mistake during labor and delivery could cause infant brain damage and/or spinal cord damage. If this has happened to your child, it is imperative that you speak with a highly qualified, knowledgeable birth injury attorney and explore your legal options. 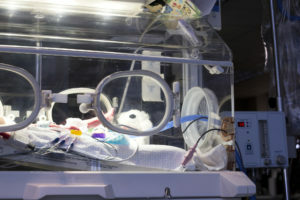 Delay in performing cesarean section: Although many cesarean section births involve potentially dangerous premature births, the timely diagnosis of fetal distress and the performance of an emergency C-section may be necessary to save the life of a baby that is not receiving enough oxygen in the womb. That’s why doctors need to monitor both mother and child throughout the pregnancy and take immediate action to perform a C-section when that type of delivery is required to prevent infant brain damage, spinal cord damage, or worse. A cesarean section might also be necessary when the baby is in breech position, which can cause brain bleeds and head trauma. Delivery errors: Misuse of forceps, failure to diagnose a prenatal condition, and failure to perform a timely C-section are just a few of the major delivery errors that can lead to significant brain or spinal cord damage. For instance, if the baby remains in the birth canal for too long during delivery, it can lead to hypoxia (oxygen deprivation) and severe brain damage. A lack of oxygen to the baby’s brain, or birth asphyxia, due to delivery error is a major cause of infant brain injuries. Improper use of vacuum extraction or forceps: Any kind of physical trauma to the baby during labor and delivery can result in brain or spinal cord injuries. This sort of traumatic damage is made more likely when the doctor is negligent in the use of forceps or other medical instruments. For example, the doctor may misuse the forceps, resulting in bleeding in the child’s brain. Or the doctor may misuse the suction cup during a vacuum extraction delivery and cause a subgaleal hemorrhage. Failure to recognize and treat fetal distress: if the baby is deprived of oxygen for an extended period of time due to placental abruption, uterine rupture, preeclampsia, or some other complication during labor and delivery, it could result in significant brain damage. One of the most common brain injuries caused by lack of oxygen is hypoxic ischemic encephalopathy (HIE), which results in significant damage to brain cells and can cause infant death. Failure to diagnose prenatal medical conditions: Doctors need to monitor both mother and child throughout the pregnancy so that any serious prenatal conditions can be accurately diagnosed and quickly treated. For example, if doctors do not accurately diagnose an infection in the mother during pregnancy, that same infection could potentially affect the baby. Other conditions such as gestational diabetes also increase the likelihood of birth injuries. Epidural abscess and cord compression: Any kind of umbilical cord problem during labor could result in brain damage to the infant. For instance, cord compression or the cord becoming wrapped around the baby’s neck can cut off oxygen flow to the baby’s brain. Surgical error compromising the spinal cord or brain: A surgical error during labor and delivery can seriously compromise the infant’s brain or spinal cord. This is especially true of emergency C-section deliveries, which involve surgical incisions into the mother’s uterus and abdomen and put both the mother and the child at risk of injury or illness. Anesthesia errors: An anesthesia mistake prior to delivery can lead to a sharp decrease in the mother’s blood pressure. If the mother’s blood pressure gets too low, it could result in the baby receiving insufficient oxygen and suffering catastrophic brain damage. When babies are improperly delivered, or when their delivery is inappropriately delayed, the results can be dangerous, if not deadly. A brain injury might be the most serious injury that a child can sustain during labor and delivery. From a medical perspective, brain cells are susceptible to damage and/or complete destruction when deprived of oxygen. Even when the child’s brain injury is diagnosed early through careful monitoring after birth, it may not be possible for doctors to effectively treat the injury and reverse the damage. Depending on the extent to which the brain is damaged, a child can be faced with permanent neurological impairment, nerve damage, decreased muscle control, and organ malfunction. The brain and the spinal cord are extremely complicated areas of the body – and they are extremely sensitive, as well. This is particularly true when it comes to the brain and spinal cord of an infant, since both areas are in the early stages of development for a newborn. Even a minor injury to a baby’s brain or spinal cord can be devastating. In fact, an injury to a baby’s brain or spinal cord can cause lifelong injuries to the infant, meaning that they could suffer the consequences throughout their lives and into adulthood. Possible complications from a newborn brain or spinal cord injury can include a learning disability or a physical impairment that makes even performing normal daily tasks a significant struggle. For instance, brain damage due to lack of oxygen in the womb could cause the child to suffer cerebral palsy, epilepsy, and other developmental disabilities. Depending on the extent of your child’s brain or spinal cord injury, there could also be significant expenses later in life for numerous surgeries, regular hospital visits, physical therapy, occupational therapy, speech therapy, medical imaging such as X-rays and CT scans, pain medication, and other expenses related to medical treatment. The experienced legal team at Fronzuto Law Group is prepared to help you obtain compensation for a medical error that resulted in brain damage or spinal cord injury for your baby. Upon entering your case, we will work with you to develop a comprehensive assessment of your child’s long-term needs, including special education and tutoring, at-home accommodations, physical, occupational, and speech therapies, and any of the other additions and alterations that may assist them with living their best life. We will then seek maximum damages to provide for you and your family as we move forward together. As part of our commitment to personalized service, our lawyers are always accessible to address your questions or concerns. Contact us for a free initial consultation about your case: 973-435-4551 (toll free at 888-409-0816).